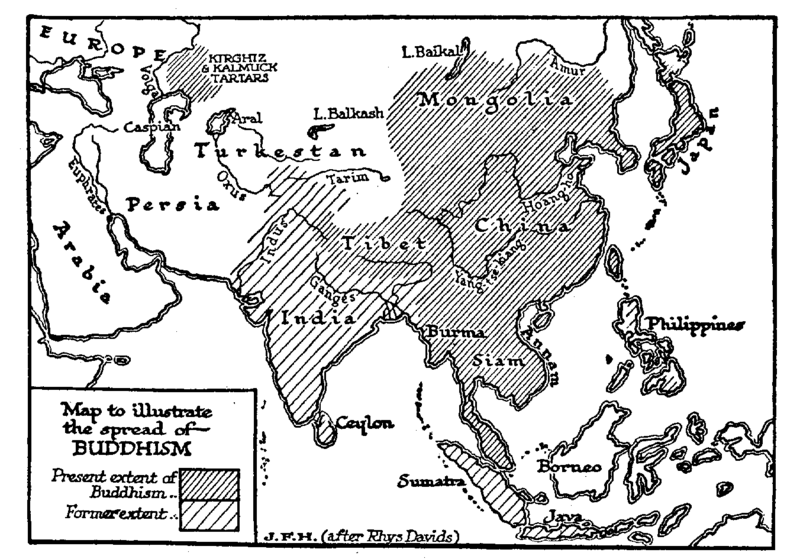 For some time Buddhism flourished in India. But Brahminism, with its many gods and its endless variety of cults, always flourished by its side, and the organization of the Brahmins grew more powerful, until at last they were able to turn upon this caste-denying cult and oust it from India altogether. The story of that struggle is not to be told here; there were persecutions and reactions, but by the eleventh century, except for Orissa, Buddhist teaching was extinct in India. Much of its gentleness and charity had, however, become incorporated with Brahminism. Over great areas of the world, as our map has shown, it still survives; and it is quite possible that in contact with western science, and inspired by the spirit of history, the original teaching of Gautama, revived and purified, may yet play a large part in the direction of human destiny. But with the loss of India the Aryan Way ceased to rule the lives of any Aryan peoples. It is curious to note that while the one great Aryan religion is now almost exclusively confined to Mongolian peoples, the Aryans themselves are under the sway of two religions, Christianity and Islam, which are, as we shall see, essentially Semitic. And both Buddhism and Christianity wear garments of ritual and formula that seem to be derived through Hellenistic channels from that land of temples and priestcraft, Egypt, and from the more primitive and fundamental mentality of the brown Hamitic peoples.